On August 19, Major League Lacrosse capped off another closely contested season with a rematch of their 2016 championship. The Ohio Machine and Denver Outlaws proved themselves to be the top two teams throughout the regular season and the final in Dallas at The Star in Frisco, Texas lived up to the regular season hype both squads generated. In 2016, Denver rallied behind their veterans and rookies to reel off six straight wins and come from behind in the finals to claim another Steinfeld Cup. Ohio led for most of that game, but saw their hopes wash away after a rain delay that saw the Outlaws reign supreme. The Machine entered the 2017 finals with the memory of their defeat and the struggles of many of their top point sorcerers from last season unable to join the team at the start of the regular season. It took a while, but general manager John Algie and head coach Bear Davis transformed the Machine from two-time 2-12 seasons to a playoff and championship contender. Ohio knocked on the door several times, but found themselves unable to capitalize on the opportunities. As with all champions, the Machine kicked the door open this season and claimed the coveted prize of a MLL championship. Ohio started as an expansion team in 2012, taking the Machine name from the Chicago franchise that relocated to Rochester and took over for the Rattlers after that team moved to Hamilton. After back-to-back 2-12 seasons, the 2014 team made it to the playoffs behind Kyle Harrison, Peter Baum and Tom Schreiber. These three landed in Ohio thanks to Algie and Davis. This gave the Machine immediate contender status. The magical turn around season ended at the hands of Rochester. In 2015, Ohio again made the playoffs, but the Rattlers bounced them for the second year in a row. The Machine finally made their way to championship in 2016, but lost in the infamous rain delay game that saw Denver come from behind to claim the title. Fans and writers began to question if Ohio knew how to win a championship. The Machine began the 2017 season with two wins before falling to Rochester and then the Charlotte Hounds. Ohio responded with dominant wins over Florida and Chesapeake then struggled with Boston, who missed the playoffs, in back-to-back games. Chesapeake gave Ohio all they could handle as the Bayhawks went on a late season surge. New York and Denver beat Ohio, but the Machine responded by defeating Denver the following week in a closely contested game. The Machine then dismantled New York by seven goals, but were snake bitten by Rochester in the regular season finale. Ohio and Denver spent most of the season alternating between number one and two. Denver defeated Rochester in the semifinals while Ohio downed Florida. It appeared that a rematch from last season’s championship was inevitable. Ohio seized their opportunity as Peter Baum, Kyle Harrison, Tom Schreiber and Marcus Holman helped take the lead from Denver in the third quarter and put the game out of reach in the fourth. 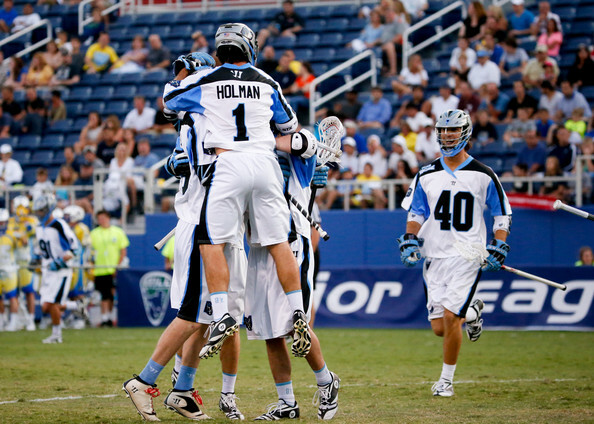 Holman went on to win game MVP for his three-goal performance in the fourth quarter. The core assembled by Algie (Baum, Harrison and Schreiber) left their stamp on the game as they helped right the ship during the third when the Outlaws appeared primed to run away with another championship. The Machine’s roster made their mark on the league as well. Schreiber won his second straight MVP award. Goaltender Kyle Bernlohr was named the most improved player. Five members of the team were named to the All-MLL team including Brian Karalunas, Matt McMahon, Schreiber, Baum and Holman. With their victory, the league sees a first time champion in Ohio that reflects the spread of the game across the United States. The NCAA will experiment with a shot clock in the fall and the continued quality of venues like The Star bode well for the league. As with any endeavour, there aspects that must be improved and with luck, they shall. This past season rivaled 2016 for storylines, drama and on-field play. It leaves us looking forward to next season and hopefully expansion. Until then, see you in Siesta Key!